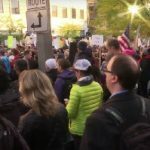 On October 13th, 2017, protesters gathered in downtown Bellevue to protest Education Secretary Betsy DeVos. DeVos was in town to speak at the Washington Policy Center’s annual dinner. Meanwhile, about a dozen counter protesters gathered nearby in support of DeVos. KBCS’s Ruth Bly and Devin Williams spoke with individuals from both protests. In addition to the audio stream bellow, KBCS also captured this video footage of the event.